I’m often asked to recommend a cooking class in Siem Reap and I’m ashamed to admit that I’ve never actually taken one in temple town. I’ve looked at a few but they all seem painfully tourist-oriented, and the menus are always the same: spring rolls, green mango salad, and amok. You’ll learn as much about Cambodian cuisine from these classes as you’ll learn about local culture by hanging out on Pub Street. But when I heard that one of my favorite restaurateurs in town had decided to offer a daytime cooking class, I was eager to try it out. Sela has a open-air restaurant on the outskirts of Siem Reap that’s frequented almost exclusively by locals. On the property he has a small organic garden and a few chickens and dogs wander around the place. To my eyes, it’s the perfect spot for a cooking class. We made this! 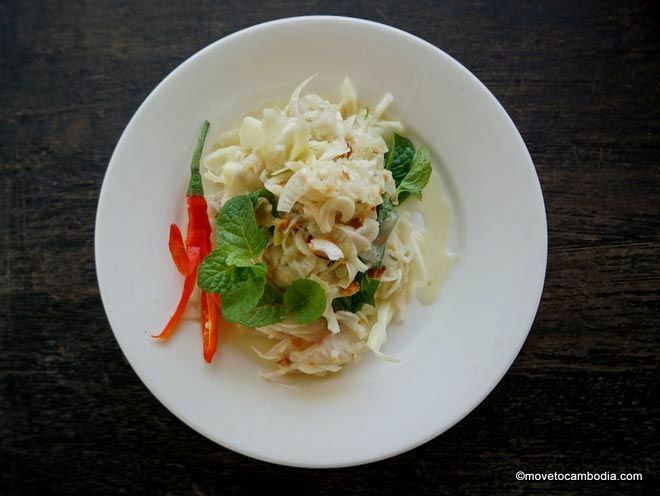 Young banana tree salad with fish marinated in lime juice. So when I had family visiting, I took the opportunity to try it out. The name of the class is Somlor Kakor Cooking Class, which I took as a good sign. 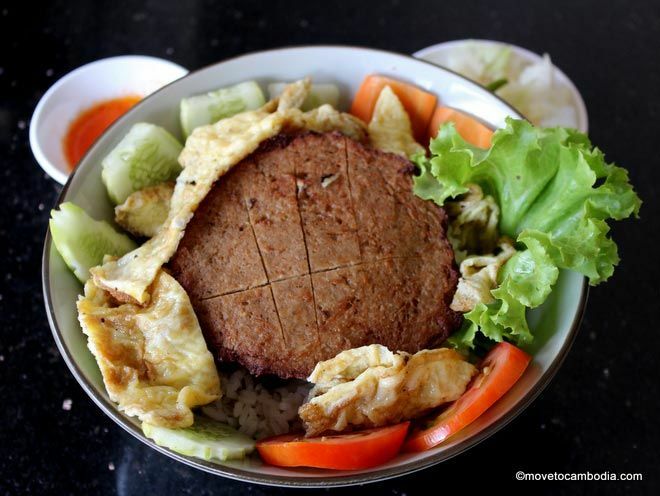 Somlor kakor is a quintessentially Cambodian dish, and one that you’ll never find on the menu at restaurants aimed at foreigners. The class, which is run by Sela and his wife Reakmony, starts with a trip to the market to buy the ingredients for what you’ll be cooking in the class. Sela is fluent in English and delights in talking to foreigners about the finer points of Cambodia ingredients, culture, and gardening. 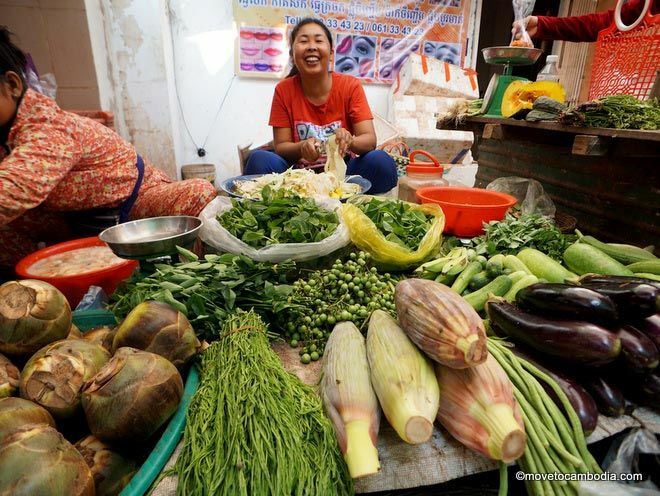 Our out-of-town guests loved the chance to check out a crowded local market in full swing—a truly Cambodian experience. Everyone at the nearby market was happy to see us. Then, we headed back to the restaurant, where we set to work cooking our lunch. The class is held in a covered area outside overlooking the garden. Reakmony (who goes by Ny) is the chef while Sela explains the ingredients and techniques, and their adorable daughters wander in and out of the class. In our class we made young banana salad with river fish, somlor kakor, prahok ktis, and bobor tra’ov. The salad was made from the soft and mild heart of a young banana tree and snakehead fish marinated in lime juice and served with galangal, shallots, and garlic. Somlor kakor is “the most Cambodian dish,” according to one of my Khmer chef friends. It’s a hearty soup made from scraps of all sorts of vegetables, which could include green jackfruit, long beans, eggplant, and green banana. We made it with both catfish and pork belly, certainly more extravagant than the usual preparation of fish only. The ingredient that makes kakor unique is ground toasted sticky rice, which gives the soup a lovely texture. Sela and Ny working on the dish their class is named for. Prahok ktis is one of my favorite dishes, made up of minced pork, prahok, and coconut milk sweetened with palm sugar—it’s like the Cambodian version of a sloppy Joe, but served with fresh raw vegetables instead of a bun. 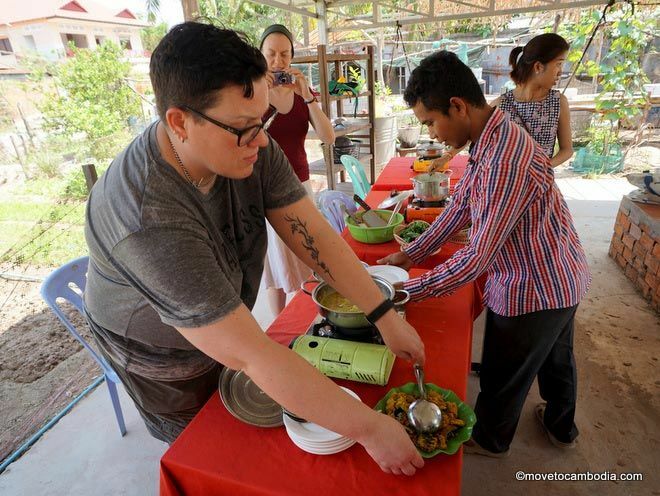 I’ve never seen any of the dishes we made on the menu for any of the tourist cooking classes, despite the fact that they are classic dishes beloved by Cambodians. What I liked about the class was that it is as hands-on as you want it to be. If you just want to watch Ny cook and hear about Cambodian food from Sela, that’s okay. But if you want to make the entire meal, they have set up stations for everyone to chop and cook. Our group included a few chefs and a couple of people who were content to watch the others prepare lunch while sipping on an Angkor beer. Setting out the spread with everything we had made. After we finished cooking the meal, we laid out the table and got to eat everything we had just labored over. Everything we made was delicious and authentically Cambodia. This was true Khmer home-style cooking, and made for a great half-day experience in Siem Reap. Classes at Somlor Kakor Cooking Class cost $30 per person, with an $8 supplement for those who do the class on their own. The price includes lunch, bottled water, and hotel pick-up and drop-off. Beer is available, but not included in the price. Booking in advance is recommended. 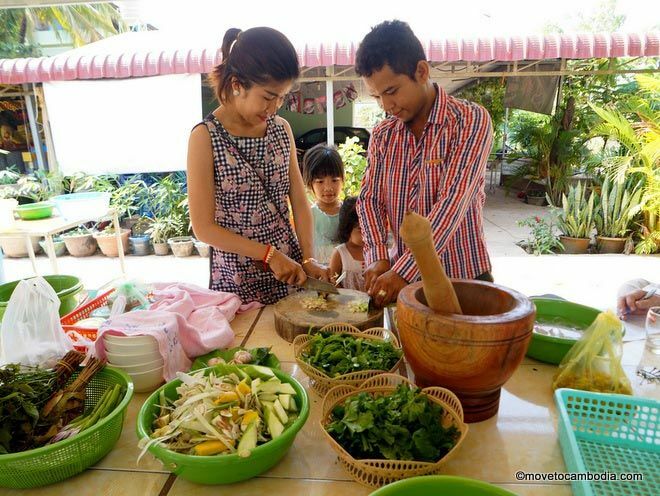 This entry was posted in Siem Reap, Food and tagged Khmer cuisine, cooking class, Somlor Kakor Cooking Class. Bookmark the permalink. We did this cooking class a couple of days ago and it was amazing. I didn’t want a class aimed at the masses and was looking for something more authentic. I found out about this cooking class from the Move to Cambodia website. Sela organised for us to be picked up by tuk-tuk and took us to his restaurant and small organic farm. Sela is passionate about his farm and restaurant, and teaching others to give them a chance to get ahead. He recycles everything and collects all water for re-use. He uses companion planting and believes that with careful management everything will be in balance. After showing us what we were going to cook and teaching us about the ingredients, Sela and his friend (and chef), Salein, took us to the local market to buy the ingredients. This was a real local market…we were the only westerners in it. We ate our breakfast at a tiny stall there, eating the freshest Lort Cha possible. Absolutely delicious. The meat and the vegetables were all so fresh it was amazing. We then returned to the restaurant to cook our lunch. We made 4 delicious dishes and did all the chopping and grinding ourselves. Sela’s 10 year old daughter came home from the “extra” school and patiently showed our daughter how to slice the bitter gourd very thinly. Her English is as good as ours and she can read it very well too, at only 10 y.o. After cooking our meals, we sat down and ate them all together as Sela talked about his farm and the origin of the dishes. 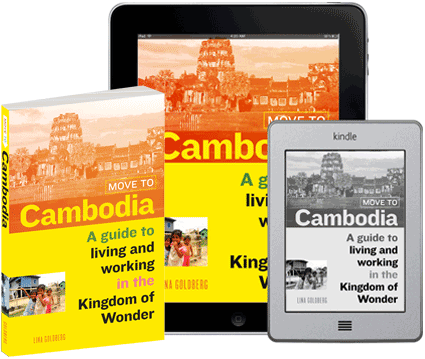 The dishes we cooked are not found on restaurant menus but are the authentic Cambodian food. He taught us about balancing flavours and how to make the aromatic paste that can be the base of so many different dishes. This was certainly one of the highlights of our trip and I would very highly recommend it to anyone who would like an authentic Cambodian experience. It was a wonderful morning. Thank you Sela and Salein. Glad you liked it. We did, too!